Get in on Some of the Best Crochet, Knitting and Craft Classes at CreativeLive — For Free! Crochet 101 with Vickie Howell: This is a crochet class for total beginners and also for crocheters who are new enough to the craft that an overview of the basics would be helpful. The class will stream at no charge on November 12-13, 2018. 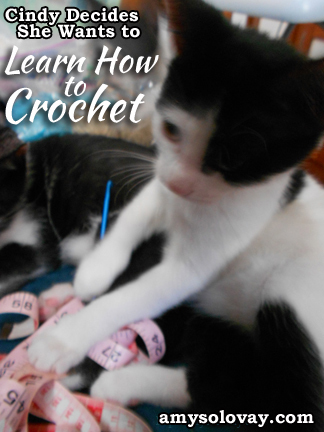 While I am not a beginner to crochet (Far from it), I am planning to watch this class. I get many questions about crochet from total beginners, and I find it useful to familiarize myself with as many of the available beginner’s resources as I possibly can. Crochet 102 with Vickie Howell: This is a crochet class that could help you get a better understanding of some advanced beginner and intermediate crochet techniques. This class will help you understand more about crocheting in the round and other topics. The class will stream at no charge on November 13-14, 2018. Knitting 101 with Vickie Howell: This is a basic introduction to knitting for complete beginners. If you’ve been wanting to learn how to knit, but haven’t taken the plunge yet, this is a great opportunity to dive in and do it! November 14-15 is when the no-charge broadcast of this class will be taking place. Knitting 201 with Vickie Howell: Would you like to learn how to knit socks? If so, tune into the free broadcast of Vickie Howell’s class called Knit Maker 201: Knit Socks at Creativelive. The free broadcast of this sock knitting class will take place on November 15-16, 2018. I caught part of this sock knitting class when they broadcast it last year, and found it worthwhile — although I still can’t exactly claim to be a sock knitting expert. In fact, I’m planning to watch the class again when it airs this month. I RSVP’ed for the class and am looking forward to it. 🙂 If sock knitting interests you, I hope you’ll have a chance to check it out, too. This isn’t usually a free class; the regular class price is $29. So getting in on the free broadcast is actually a really good deal. Making Fabric and Yarn With Sweaters — Blair Stocker Is the Instructor: I think this is going to be a useful class for any of you who a) have good thrift stores within easy traveling distance or b) have sweaters that are no longer useful in their current form — perhaps they’re out of style, outgrown by the children they were made for, or they have stains that make them unwearable in their current form. The point of the class: You’ll learn 2 different ways to transform these unwanted sweaters back into usable craft supplies. You’ll learn how to make felted fabric out of sweaters; you can use this fabric for making felted flowers or other projects. You’ll also learn how to transform the sweaters back into usable yarn for crocheting, knitting, tassel making, pompoms or whatever other yarn crafts you have in mind. This class broadcasts for free on November 16-17, 2018. Otherwise, the class is usually $39, although at the time I’m writing this it is temporarily on sale for only $33. Here’s my understanding of the situation: If you want access to any of these broadcasts on the days they make them available at no charge, you’ll have to RSVP for each of the classes you’re interested in before it starts to air on its broadcast date. If you haven’t yet registered for membership at the CreativeLive website, you’ll have to take care of that beforehand; then log into the site so you can RSVP. Tip: After you click through to the course description page, look up at the top right-hand side of your monitor for the black button that says “RSVP”. If your RSVP was successful, you’ll get an email confirmation from CreativeLive letting you know. I’ve been a member of the CreativeLive website for several years (since 2015!) and I can vouch for the site; I’ve learned a TON from watching their videos and reading their blog posts and emails. Overall, I think they do a great job with finding interesting and knowledgeable instructors. I really enjoy their website, and I hope you’ll find it helpful, interesting and enjoyable, too. This entry was posted in Crafts, Crochet, Felting / Fulling, Knitting on November 5, 2018 by Amy. In my last knitting and crochet newsletter, I invited my subscribers to vote in a poll and give me feedback regarding which pattern formats they prefer. I don’t know why on earth it didn’t occur to me to post about it here sooner. 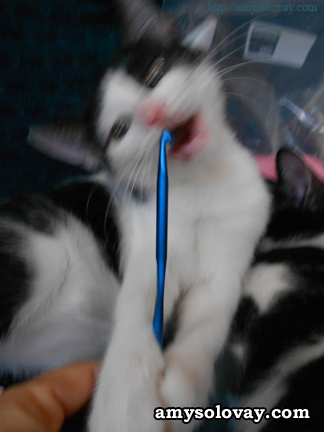 To those of you who knit and crochet, I’d like to extend the same invitation: Please vote! I’d love to know which pattern format(s) you’re finding most valuable right now. I’m actually pretty surprised with how the poll results have been shaping up so far. As of the last time I checked, it appears that pattern books are the format that many of y’all prefer. On one hand, not enough of you have voted for the data to be statistically significant at this point — so I’d definitely like to have more data. But on the other hand, enough votes have been posted in favor of pattern books that I’ll definitely devote more time in the future to writing pattern book reviews and submitting my own patterns to pattern books (although don’t worry, I don’t plan to stop posting my patterns on the internet any time soon). It would really help me out if more of you would be willing to vote in the poll. With there only being so much time in the day, it’s important to me to understand what’s most important to you right now — so I can focus my energies in the right direction when working on which content to post and share with you in the future. I really value your feedback. Thanks in advance for any insights you have to share. This entry was posted in Crafts, Crochet, Knitting, Reader Polls on November 4, 2018 by Amy. Since Valentine’s Day is coming up soon, I thought it would be interesting to dig into my project archives and take a look at some of the Valentine crafts I’ve made in the past. Crocheted Heart Embellished With Lace Trim, Flowers and Satin Bow — Free Crochet Patterns Are Available for Both the Heart and the Lace Trim. Crocheted Heart Embellished With Lace Trim, Flowers and Czech Glass Button. Several years ago, I had such a great time embellishing these hearts that I’m thinking of crocheting a few more of them this year. My daughter is getting old enough that she might like to help me choose the embellishments for them. Lately, she’s had a thing for pompoms. Perhaps we could use a couple of these heart shapes to make a pompom embellished heart pouch or a child-sized purse for her to use for carrying her treasures. Want to Make Some of These Fiber Art Hearts Too? 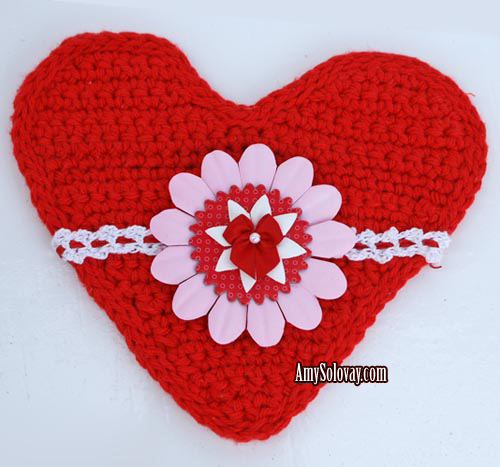 Here ‘s a link to the free crochet pattern for making the heart motif. 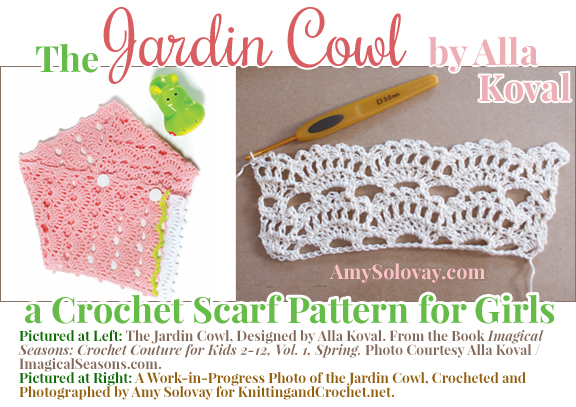 There’s also a free pattern for crocheting the lacy trim with ribbon. I used crochet thread to make mine. Then there’s even more eye-candy: I posted a list of free heart patterns featuring even more idea for heart projects you can knit, crochet and craft. A couple more related resources: Valentine knitting and crochet patterns; and craft projects for holidays and special occasions. Czech Glass Button: I purchased a bunch of these lovelies from a seller in the Czech Republic who is apparently not selling online any more. Good thing there are many more incredible choices for finding Czech glass heart buttons. I originally published this post on Feb. 26, 2010 and last updated it on January 9, 2018. 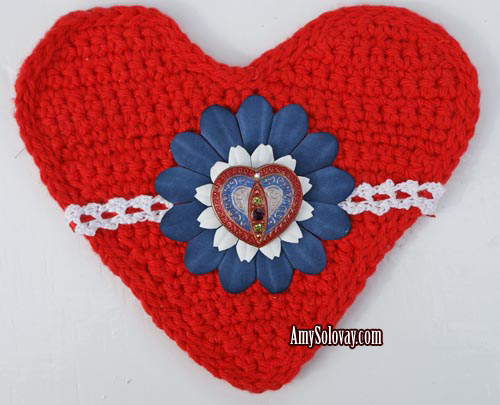 This entry was posted in Crafts, Crochet, Heart Crafts, Holiday Crafts, Valentine Crafts on January 9, 2018 by Amy. 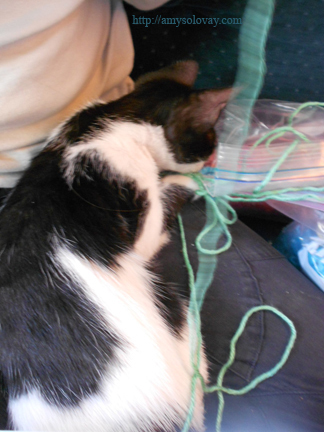 Cindy says, “Mommy, I’m going to learn how to crochet!” She grabs my crochet hook and begins wrestling with my tape measure. 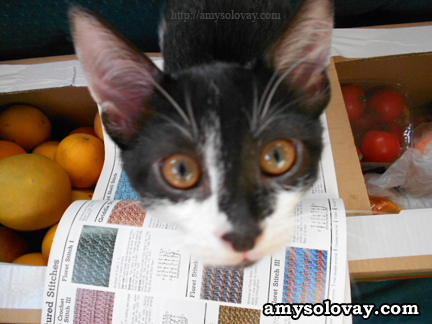 This entry was posted in Crafts, Crochet, Kittens and Cats and tagged crochet, kittens on October 23, 2017 by Amy. Do you enjoy learning new skills by video? If you do, I hope you’ll share my enthusiasm for an amazing personal development resource I just discovered. It’s an Internet-based platform for video classes taught by some of the world’s most creative, innovative, successful and admired individuals. The best part is that you can take advantage of a huge variety of different video classes offered for FREE! Craft photography fundamentals taught by Candice Stringham on October 8-9, 2015; if you miss the free broadcast, or you’re busy that day but you still want to take the class, you’ll have the opportunity to get access to it for $79 US dollars. How to write a blog post that drives traffic taught by Darren Murph; the free broadcast happens on October 30, 2015. If that day doesn’t work for you, you’ll still be able to take the class on a different day, at your convenience, for $29. If you want to see a list of all the upcoming free broadcasts at CreativeLive.com, check out this page. Which classes will you sign up for? This entry was posted in Uncategorized on October 5, 2015 by Amy. So far, today has been a great day! When this crochet baby bib has been completed, it will look like the loch ness monster. Right now, it’s a work in progress. â€¦a couple of my works-in-progress, as pictured above. â€¦was a long walk. We started off walking by the beach. It was a hot day, but there was a lovely breeze blowing, and the Mediterranean Sea was dotted with whitecaps from the wind. Mike did his usual workout by the beach. While he was doing that, I walked up and down the stairs connecting the beach and the cliff several times. I’m hugely pregnant at this point, and I’m finding that even walking slowly is getting to be a major exertion — let alone climbing stairs. 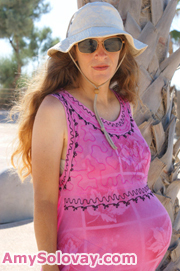 But my midwife has advised me to take a walk every day, so I am walking. I also remember reading that climbing stairs helps get a baby’s head settled into mom’s pelvis. I definitely want to make sure my baby stays head down, and tired as I may be, this is a high priority. From there we walked to the neighborhood grocery store to pick up a few things. This wasn’t really a workout by my previous standards, but it was sufficient to tire me out. I’m not sure how much baby weight I’m carrying, but it’s probably in the range of 30-35 lbs — which for me is a massive weight gain. By the time we got back to the boat, I was thrilled to sit down and relax a bit. This entry was posted in Uncategorized on July 14, 2015 by Amy. For the past few days, I’ve been putting together a roundup of 4th of July crafts and DIY project ideas over at FreeCrafts.info — and I want to mention that to you before I get sidetracked sharing insights about other related and unrelated topics that are competing for space in my brain. 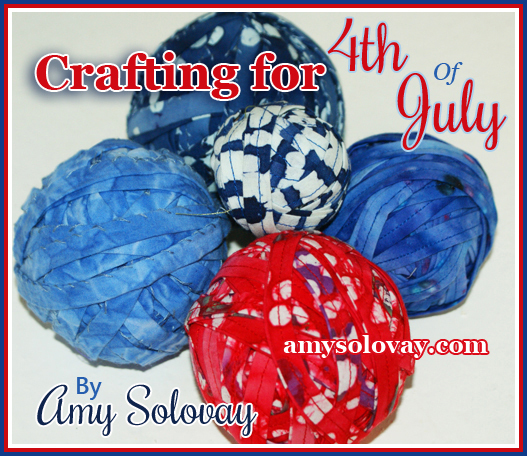 If you celebrate 4th of July, and you like to work on craft projects, I hope you’ll check out the page. I’ve shared pictures, tutorials, instructions, patterns and links for bunches of different ideas, from red white and blue spin art to various DIY jewelry-making, crochet and beading projects. The objects pictured above look sort of like balls of red, white and blue yarn, don’t you think? They’re actually rag balls: that is, cut-up strips of fabric that have been wound into balls. You can You can knit or crochet with them in much the same manner you would with yarn, but they’re made of fabric. with them in much the same manner you would with yarn, but they’re made of fabric. I’ve used these to make one of the craft projects included on the list —this easy crochet necklace. Because the fabric looks and behaves differently than yarn does, it’s really interesting to craft with it. One of the most intriguing things about the process, to me, is that you can introduce interesting prints and patterns into your knitting or crochet. I love experimenting with novelty yarns and variegated yarns: tweedy looks, space-dyed colors, boucles, etc — but the ability to add actual printed patterns to the mix is priceless. The picture above only gives you a glimpse into the possibilities, as the fabrics I’ve used here are interesting but not that intricate. They’re batik fabrics with subtle patterning, which I think is perfect for the sorts of fabric crochet projects I like to make. However, I invite you to use your imagination for a moment, and dream of how it might look if you were to make rag balls out of — for example — a printed fabric with red ground and small white stars, or perhaps a bandana print, or a blue and white gingham checked fabric. I’d be interested to try incorporating fabrics like these into my own fabric crochet work. When crafting for holidays like 4th of July, I imagine that using such fabrics could add a whole new dimension to each finished project. For example, it could allow you to introduce relevant patterns, like stars, into each finished piece, without the obligation to actually crochet or knit any stars. I find these ideas so intriguing that it’s all I can do not to drop everything else I have in progress and go off on this fun tangent — and someday in the future I hope I’ll be able to explore these ideas further. Right now, being pregnant, I have to prioritize working on baby projects. I have bunches of those in the works too, and if all goes according to plan, I’ll be sharing the patterns and instructions for those with y’all shortly. I apologize that I haven’t been sending out newsletters regularly; I’ve totally dropped the ball on that, and I feel really bad about it. I have so many things to share that by now it’s a little overwhelming to even think about all the stuff that’s going to be included in the next newsletter I do send out. I predict it is going to be absolutely packed with patterns and projects and ideas. I’m hopeful that I’ll even be sharing some of my best ideas and projects ever. If you’re one of my newsletter subscribers, I really look forward to sharing these projects with you — but please bear with me while I pull them together in some sort of understandable format! Thanks for your patience with me, and please know that I really appreciate your subscription — and your interest in my work. And if you aren’t already a newsletter subscriber, I invite you to subscribe now, because I don’t want you to miss out on any of the fun. Especially if you enjoy crocheting or knitting baby projects! This entry was posted in Uncategorized on June 1, 2015 by Amy. 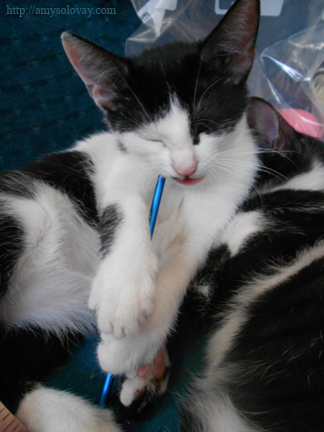 Now the kitties are all sleeping like little black and white angels. Happiness = 4 adorable sleeping cats. I ended up being more productive than expected today. No sleeping for me — not even a little nap. …a swatch of “zig-zag lozenge stitch”, from Sarah Hazell’s Crochet Stitch Dictionary. Today I crocheted this swatch of a stitch called zig-zag lozenge, from the book Crochet Stitch Dictionary. This is an intriguing stitch that I’m interested in trying again, next time in stripes of three different colors. 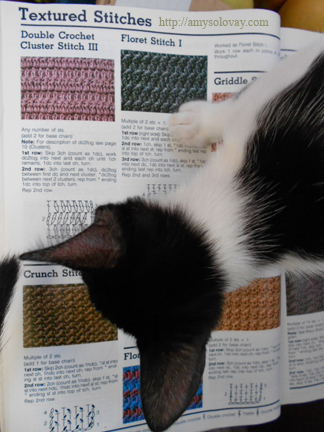 This book review of Susan Lowman’s filet crochet pattern book. The short version of these reviews: I love both these books, and highly recommend them. I invite you to check out the reviews if you’re curious about the details of why. Thanks for dropping by! I really appreciate your interest. This entry was posted in Uncategorized on May 25, 2015 by Amy. Today is May 24, 2015 — time to dust off my blog and get back to posting after another long, unintended absence. I’ve been busy doing a bunch of freelance writing, which means I’ve been updating zillions of other peoples’ blogs — just not this one. I also hadn’t been crafting much until Monday, when I finally started a new crochet project. I have been meaning to get busy with making baby projects for months now, but squeezing in the time to do it has been a problem. â€¦the “Messy Nessie Baby Bib” from Beastly Crochet. This is a surprising turn of events, as I don’t work from other designers’ patterns all that often — plus the pattern isn’t really my style. This decision came about because I happen to have both the pattern and appropriate yarn on hand, which is a minor miracle. At the moment I have to work from stash, and this was the most workable combination of baby bib pattern and yarn I was able to put together with what I have aboard our boat at the moment. I’d rather be making Robyn Chachula’s “burp cloth bib” from Baby Blueprint Crochet. However, my copy of that pattern book is in storage in California, and I am in the Mediterranean, so that’s not an option. Oh well, I think it’s fun to wander out of my comfort zone every once in awhile. As far as baby bibs go, the kid will likely be spilling food all over it. So really, on a scale of things to worry about, the design of one bib is not a biggie. Organic / free range egg and veggie wraps with fresh, homemade, made-from-scratch bread that is something of a cross between a tortilla and a pita. A gigantic fresh organic salad that was herbed beyond all reasonable levels of flavorful. I asked Mike to stuff my usual bowl full of cucumbers, tomatoes and salad veggies with loads of additional fresh basil, turmeric, garlic and other herbs in an attempt to increase my mineral and nutrient consumption. He complied and I dutifully ate it all, although my taste buds were in shock. Fresh organic pasta with tomato sauce that Mike made by hand, from scratch, using spelt flour. Do the words “unbelievably, amazingly yummy” mean anything to you? The man is spoiling me. Wasn’t actually a workout. Does a leisurely moonlit stroll by the beach count? No? OK, just checking, but I didn’t think so. I’m still trying to keep active, but the workouts I was doing before are out of the question at the moment. Before my pregnancy, I was doing a lot of lifting-my-own-body-weight type exercises. The more baby weight I gain, the less I feel like doing those. I’m keeping up with my walking (more or less — my speed has slowed a lot) and doing gentle stretching, but tonight, for me, a walk was enough. This entry was posted in Uncategorized on May 24, 2015 by Amy. Who’s making gifts for Dad this year? If your plan is to make a Father’s Day gift for your Dad, this is a great time to get started on the project. This year, Father’s Day occurs on Sunday, June 21, 2015 — so you have time to get a hand-crafted project done, although not too much time. You probably already have about a zillion ideas for things your dad might like you to make for him. You know more about his tastes, interests, talents and preferences than any random blogger on the Internet who puts together gift-list ideas would. But still, it can be interesting to check out other peoples’ gift lists and then put your own spin on them to come up with the perfect gift. So whether or not you’re actually in need of gift ideas, you may find it interesting to look through some lists to get an idea of what other people find gift-worthy. I invite you to check out this list of Father’s Day craft ideas. It’s a list for do-it-yourselfers of all persuasions, with some interesting options for crocheters, plus plenty of other craft ideas. Here’s another reminder: you probably also want to remember to take care of any Father-in-laws, stepdads, granddads, and other father-figures on your gift list. Whatever gifts you decide to make for the guys on your gift list, I’m really hoping they’ll love ’em.